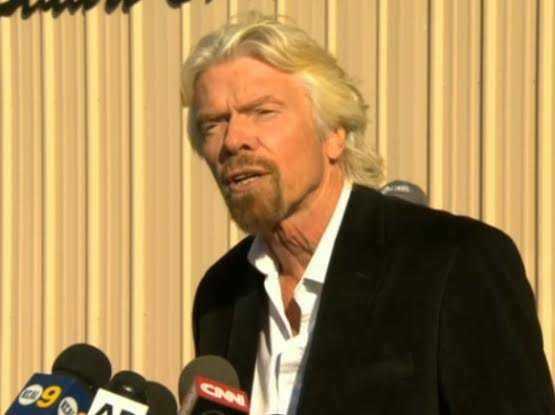 Virgin GalacticRichard Branson speaks to the media after the crash of SpaceShipTwo. Just a three days after Virgin Galactic’s SpaceShipTwo spacecraft crashed in the California desert, Virgin Group founder Richard Branson told CNN’s Poppy Harlow that he would “certainly be the first to travel” to the edge of space if the company resumes its efforts to provide $US250,000 rides to customers. The company has so far collected nearly $US90 million in deposits for planned flights of approximately 2-3 hours, with several minutes of weightlessness. In the aftermath of the death of test pilot Michael Alsbury in last Friday’s crash, Branson noted that risk is an inherent part of aerospace innovation. He reminded Harlow that forms of air travel now widely considered to be extremely safe were once fraught with danger. As the government crash investigation begins, questions have arisen about Virgin Galactic’s rocket and spacecraft designs. Initial attention was focused on the propellant used to power the rocket. But scrutiny has now shifted to the way the pilots configured the spacecraft’s aeronautics, as the New York Times reported on Monday. Branson said that Virgin Galactic and its partner, Scaled Composites — the company that designed and built SpaceShipTwo — will get a new spacecraft flying soon and will subject it to rigorous testing. “We will persevere and we will succeed,” Branson told Harlow.